Check out this interview with me on The Prosen People Blog here. Cathy Sussman: How did you come to write Best Boy? Ron Wolfson: I have always told funny and heartfelt stories in my teaching as a speaker and scholar-in-residence. I find people resonate with them. For example, I tell a story about my Old Country Hebrew school teacher who called me vildeh chayeh—“wild animal”—I was such a class clown at four o’clock on Monday afternoon. Many people have had similar experiences. Since that time, I’ve visited hundreds of synagogues and Jewish institutions during my career and seen some very funny things happen that illustrate the challenges of engaging Jews with Judaism. I thought it would be a good idea to finally write down these stories, not simply to entertain, but to educate and inspire. For me, a book is an extension of my “classroom.” I reach thousands of people I will never meet in person, but I can in the pages of the book and then engage with them on social media platforms. Thrilling review from Cathy Sussman at the Jewish Book Council. She really “got” Best Boy! Through his collection of true stories in The Best Boy in the United States of America, Dr. Ron Wolfson captures the heart of the American Jewish experience. Framed between his Russian immigrant grandfather’s wet sloppy kisses and Dr. Wolfson’s own wet sloppy kisses to his grandchildren, The Best Boy in the United States of America is more than a memoir of a singular person’s experience, it is the memoir of the American Jew. His stories will make you laugh and cry—sometimes at the same time. Overwhelmed to have Jonathan Kirsch’s blessing in this wonderful review of “Best Boy!’ What a precious birthday gift!!! Thank you, @JonathanKirsch and Jewish Journal​! The Jewish community in Southern California is richly blessed with high-profile pulpit rabbis, and we tend to turn to these influential women and men when we want to know about Jewish identity and practice. But respect must be paid, too, to those whose teaching takes place outside the pulpit. Ron Wolfson, a beloved Jewish educator and author of “The Art of Jewish Living Series” and other influential books on Jewish observance and values, is one such figure. Wow! A wonderful, insightful review from Annette van de Kamp-Wright, editor of my hometown Omaha Jewish Press! Thanks, Annette, for “getting” Best Boy! I love it for several reasons. The first is: when did you last read a Jewish book that was absolutely hilarious from the first page on? Ron Wolfson’s description of his growing up in Omaha, Nebraska is so funny that I found myself buttonholing anyone that went by and making them listen to some of the lines that tickled me the most. The second reason is: When was the last time that you read a book about Jewish life that was upbeat and optimistic? Most books about Jewish life in America are books that ‘shrei gevalt’. They are full of gloom and doom. They tell you how many young Jews we are losing, and how boring our services are and that we are the last of the Mohicans and that there will be very few caring and committed Jews after us. This book does not waste space telling us how bad things are. Instead it is jam packed with success stories and with practical suggestions of what we can do to transmit the heritage to those that will come after us. And for that alone, it is a joy to read. The third reason I love this book is that it makes you cry as often as it makes you laugh. 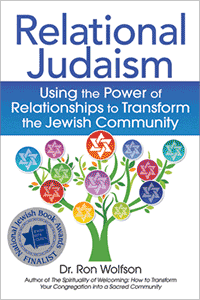 The key to this book, the key to Ron Wolfson’s educational philosophy, is that Judaism is the story begun by the prophets and the sages, continued by the saints and scholars of all the generations, treasured by our parents and grandparents, and now turned over to us to safeguard, to treasure and to transmit. And that it will only be transmitted if we teach our children the joy of being Jewish, and not just the woes that sometime go with it, and that the key to Jewish education is in the home and the family more than in the school or the library. The key to the Jewish future lies in creating precious memories that our children will be able to live off of, even after we are gone. This book is a very unusual kind of an autobiography. There is some mention, but not much, of his day job as an administrator and a fund raiser and an educator. The focus of this autobiography is on more important dimensions of his life: on what it meant to have an adoring grandfather, what it meant to have devoted parents and a very good wife, what it meant to see the recipes and the stories that he inherited take hold in the lives of his children, and what an incredible privilege it is to be a grandfather, and to try to spoil and love and teach and model for his grandchildren the way his grandfather did for him. This is a book that will tickle your funny bone many times. This is a book that will pull at your heart strings even more often. And this is a book that will prod you to think about what your own priorities are and what your own goals in life are. For all these reasons, I love this book, and I think that you will too.